On Saturday morning I dragged myself away from the computer and drove down to south Wales. Arriving at the car park about lunch time I found three minibuses and a couple of dozen cars. This was not a good start. Groups of men dressed in wetsuits and flotation gear were milling around. 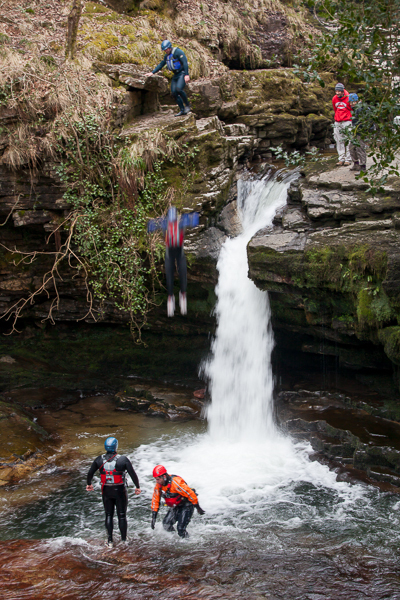 On enquiring if it was an organised event or activity, I was told that a number of individuals and groups were going gorge walking or canyoneering. My heart really sank! Plans for an afternoon of quiet enjoyment and photography by the river seemed to have hit a brick wall. In the event it appeared that they had finished their activities for the day, as no-one seemed to be using the river during the afternoon. Birds were noticeable by their absence, however. After a very cold night in the camper (ice inside on the windows…..) I made an early start on Sunday morning and walked across the footbridge to the falls. At least two pairs of dippers were present, making territorial flights along the river. I believe both they and grey wagtails nest alongside the falls, judging by their behaviour on this visit and previous ones. Very soon I had my back against a tree by the river to wait for dippers. Almost immediately a commotion of calling came from the opposite bank; a kingfisher darted out, flying away fast and low up and over the falls. Then a second bird appeared, perching on a low twig just opposite me, about twenty yards away, if that. Sitting quietly, waiting and observing, is often recommended for watching wildlife, but I had only just arrived! This was pure magic. The bird dropped down into the shallows to grab a tiny fish, which it ate after returning to its twig. I was able to quietly pull out my 7D/long lens combination and set it up on the tripod without causing any disturbance at all. At this time of year the presence of a pair suggests that a breeding attempt is imminent. But what surprised me more was that kingfishers were there at all. I had always thought they and dippers would be mutually exclusive on account of their different habitat requirements. The bird returned to its perch a short while later and caught another fish, bigger this time, which it took downstream. I had hoped to be able to photograph dippers here because on previous visits the birds had been quite approachable. I even have a picture of the falls taken with a wide angle lens on which there is also a tiny dipper. It appears on one of my postcards! As it turned out they were rather flighty on this occasion and I felt it would be better to come back later in the year to have another go. 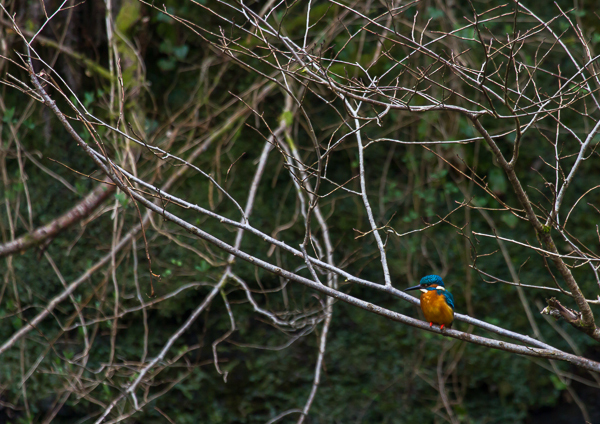 As for the kingfishers, what a bonus! I have been studying Michael Warren’s bird paintings recently. The landscapes which the birds inhabit are given equal prominence in his work in a very surreal style which is almost psychedelic. They are “in focus” from the nearest foreground detail to the most distant horizon, despite high levels of magnification. The photographer will never be able to reproduce his vision succesfully. The optical limitations inherent in our gear are just too great. But when I photograph birds I try to include their surroundings as part of the image: it’s part of my background as a landscape photographer. So while my picture of the kingfisher won’t win any prizes it is better than I can ever have hoped for. By late morning the first group of four gorge walkers appeared. They jumped down the falls, swam in the pool below, took photographs of each other, and crawled along the ledge behind the torrent – a typical dipper nesting site. They must have spent about 15 minutes doing this, then carried on downstream, crawling, swimming and jumping. I spoke to them before they left and found they were polite and reasonable people, expressing concerns about the environment. Not the type to deliberately put wildlife at risk at all. But when I mentioned kingfishers being a schedule 1 species they looked blank. They also said that in summer the valley was “mad” with canyoneers. I cannot help but believe this kind of activity is likely to have deleterious effects on the nesting birds of the river. I do not believe that river birds will be able to tolerate such a level of disturbance in THEIR habitat. Small numbers of people might be acceptable but if the numbers present on Saturday lunchtime are any indication of the levels of activity in spring and summer , I fear it is only a matter of time before desertions take place. Canyoneering is “fun” for the more adventurous amongst us, I’m sure, but it has become rapidly more popular in the last few years, and it seems to have done so beneath the radar of the authorities responsible for wildlife protection. I understand that the National Park is working on a code of conduct for gorge walking in this valley. In my opinion this cannot come soon enough, and that there should be a closed season while birds are nesting. The dipper can have a very early breeding season so March 1st might be a suitable cut off point. In the meantime if kingfishers are found to be nesting on the river then a complete ban should be placed on gorge walking there this year. I have brought this matter to the attention of the National Park authorities; and as it is sure to be an problem elsewhere in Wales (and the UK) have also informed the RSPB. This entry was posted in Uncategorized and tagged bird disturbance, canyoneering, canyoning, dipper, gorge walking, kingfisher. Bookmark the permalink.